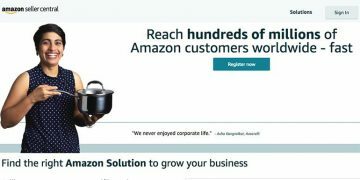 You are here: Home / eCommerce / Amazon India / How to Find the Right Product to Sell on Amazon India? 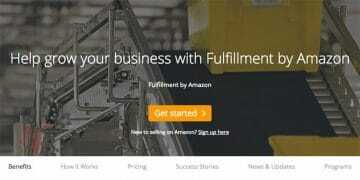 More than 5 crores (50 million) products have been added on Amazon India marketplace by various sellers. It is the leading eCommerce marketplace in India, way above the competition like Flipkart. 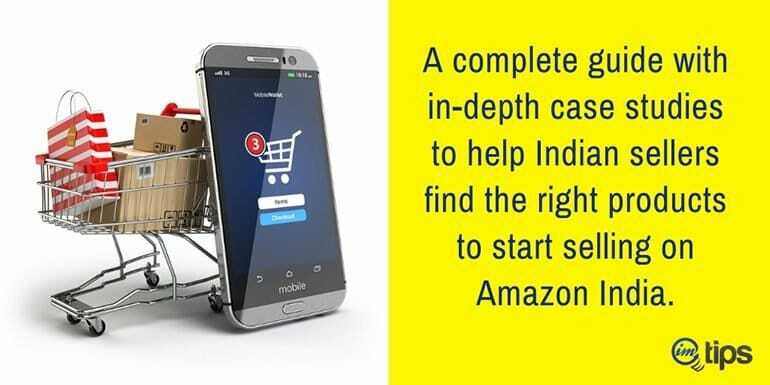 With this in mind, the question arises how do you find the right product to sell on Amazon India. If you are selling anything and still no luck then it is time to reconsider it. 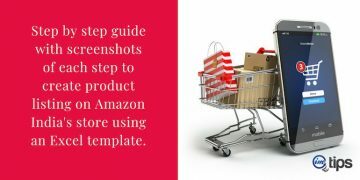 For your reference, I have shared how to register as a seller on Amazon India, how to add products to Amazon’s inventory, how to get your first few sales and review on Amazon India and how to create advertising campaigns to generate more sales. In this article, I will take one step further and try to help you find the right product that sells. We will conduct an in-depth study of different online selling models. For the purpose of easy understanding, we will take real-time product example too. Furthermore, we will see what has worked for them and how you can start selling similar items. So, the question is how to find products you can sell. It may sound tough but it isn’t. 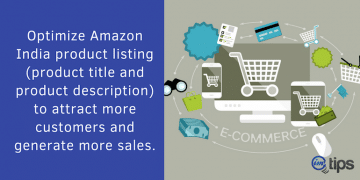 I have categorized selling on Amazon India into 4 ways. 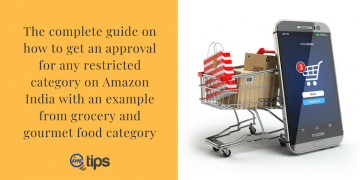 Let’s understand each of these models for selling on Amazon India. One can sell any branded items by being a distributor. For instance, if you want to sell Nestle products, then you need to check whether Nestle is taking up new distributors or not. Whether it allows distributors to sell online or not. The best way to check is to see who all are selling Nestle products on Amazon. As a note, if a multi-national company has manufacturing in India, you will never be the only seller of the products online. This way you can grab more sales at a cheaper price. This is possible only for the first level of distributors. Which means one has to surpass the entire chain of distributors, wholesaler, retailer and then come up with a dirt cheap price. Let us try to understand the distributor model with a case study. 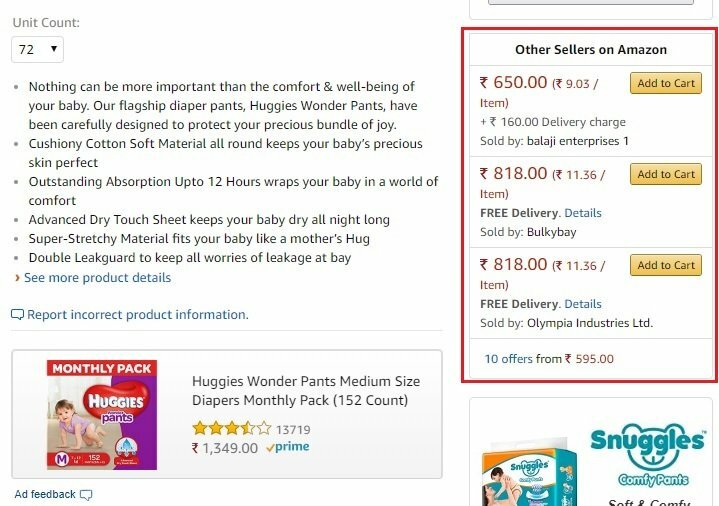 Above mentioned names are premium baby diaper manufacturers in India. 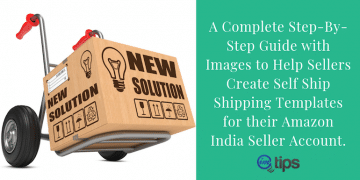 Once we look at the product listing, we have a common seller – “Cloudtail India“. They are sellers of many branded products. Now if we look into the details of each of the product that is being sold by them, we find there are many other sellers for the same products as well. Amazon also displays other sellers for the products. See the image below. So one can be a reseller (preferably a first level distributor) of these products and can start selling these items online. Selling with distributor model gives you instant start to start selling online. 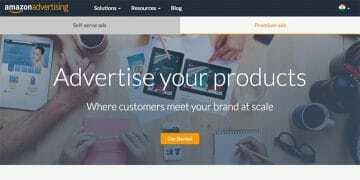 Brands have a solid online reputation which elevates your credibility as an Amazon seller. Famous brands not only provide good products but they also propose a value to the buyer and this, in turn, builds your seller reputation. An established set of customers who purchase those products become your customers too. 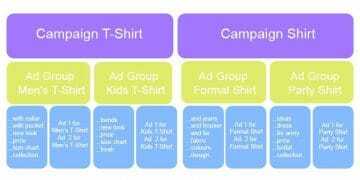 Your marketing cost is almost zero because the brand is consistently doing the brand building. You are not the sole distributor of a given product which means you will generate more sales at the cost of profit margin. You have to be the lowest price re-seller to win the order from the customer on Amazon. Amazon fees including warehouse fees can spike up selling price per unit. You may be subject to pricing by the manufacturer where you aren’t allowed to sell a product below a certain price point. Inventory may not be readily available from the manufacturer and your listing can have remained in out of stock in peak season. If you choose a brand that has a bad product, it can impact on your seller reputation as well. Indian sellers import uncountable items from foreign countries to sell online. The planning is very important when considering the import product model. I will share with you an exact example to sell online. Before that one should do the maths about the cost of logistics. This includes the importing cost and Amazon’s delivery logistics cost. The first step is to find viable products that one can import from another country. So let us understand this with a case study. Upon conducting a search on Amazon website for USB LED lights and Spike Guards I got two best-selling products in the search results. These products are non-branded and selling quite well as one can see from the product reviews and rating count. So now one has to find a reliable source of getting such products. 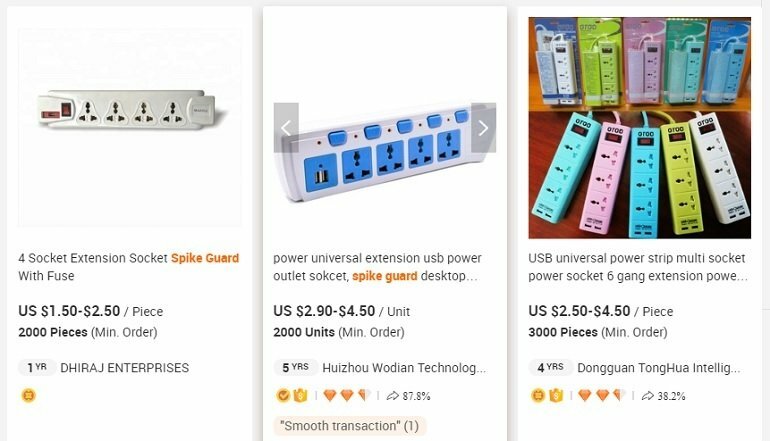 When I look into Alibaba for similar products, I get to see the following variations. The lowest I can get for an LED USB light is at Rs. 4.35 and the highest is in Rs. 32.62 with a minimum order size of 50 or 100 pieces. Similarly for spike guard (electrical extension). A single piece is Rs. 108.72 on the lower side and Rs. 326.16 on the higher side with 2000 to 3000 per order. This way you come close to a final selling price that is your cost price. 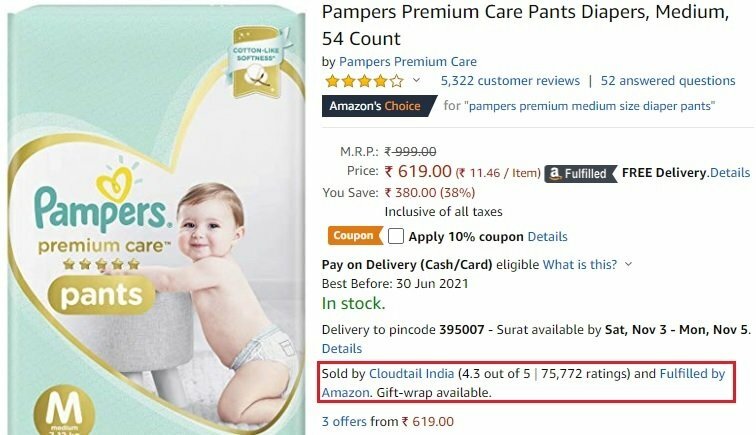 If the final selling price of a given product is above the cost price on Amazon India, it is a profitable product. The price difference should be in the range of 20% to 30% higher than your cost price because there are so many moving parts including the USD to INR. I remember a quote of Warren Buffet – Don’t Test Unknown Waters with Both Feet! 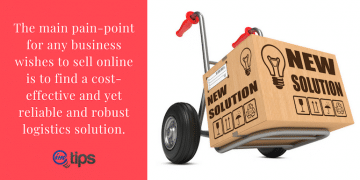 Ordering items in bulk quantity at the initial stage is not advisable and certainly not when you aren’t sure if you can sell such products online. 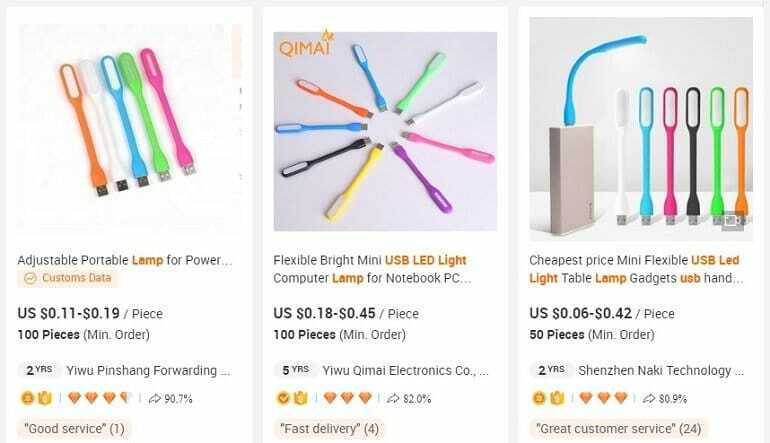 Let’s assume that you want to sell USB LED light. Instead of placing an order for an import, buy 10 or 20 USB LED lights from the local market. 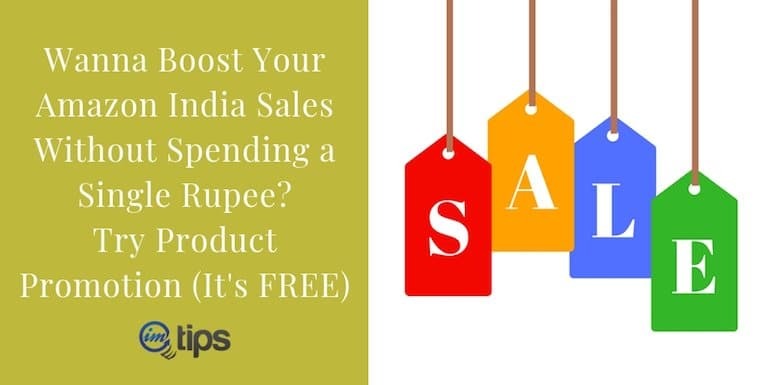 List them on Amazon India for selling but not at a price higher than your current purchase price but at a price you calculated from Alibaba. This will help you get familiar with the process of selling the exact same product online as well as help you test the complete process. Even if you make a small loss on each item being sold, consider this as a fee to learn the complete process. Once you are comfortable selling online, go ahead with the import. Again when you order an item on Alibaba, it can take a few weeks to a month to deliver. Remember, when you are starting to sell by grabbing products from a local vendor, don’t have a mindset to make a profit. It is just for testing your ability to sell the exact same product as well as consider on the selling price, delivery, packing, returns, payments etc. The primary reason importing products is you get cheaper goods but if you can order from Alibaba, others can too. One can even go for better quality products instead of trying to sell things cheaper. Importing new products will give you an edge. You are the sole distributor or seller of the product which means you can demand a better price. Less competition or no competition at all for the products. Fluctuation in foreign exchange can influence the cost price. One has to keep a bigger margin of safety all the time. Unexpected factors like change in government policies & taxes may drive up your cost. Importing goods from a foreign country involves custom clearance and other such expenses as well. Fancy Decorative Items – Wall arts, Wind Chine, Colorful bulbs, LED lights, etc. Daily Use Common Products – Mobile covers, small furniture, batteries, car parts, etc. Look-alike Legal Items (Exact replica of branded items) – Adidas, Nike, Reebok Shoes, iPhone, etc. A local item which has a presence in the physical market but not sold online is the crux of a reselling model. The biggest advantage of selling such products is having an uncontested market space with a steady demand provided no one is selling the same. For example, a local shoe manufacturer who is very famous in a location but it isn’t selling online can be a classic case. You may have this in mind – It’s just a shoe, after all, and everyone is selling it. How am I going to make a difference selling a product that 8 out of 10 sellers sell online? How my shoes will stand out as a product on Amazon India? It is because the shoe manufacturer hasn’t considered selling shoes online and you can be one of their resellers to be able to sell online. The reason it is not being sold online is that they haven’t scaled up their business to be selling it online. To understand it better we can take an example of Dolls of Bengal “Putul”. These dolls are used for decoration purpose in Bengali homes made by the local craftsmen. 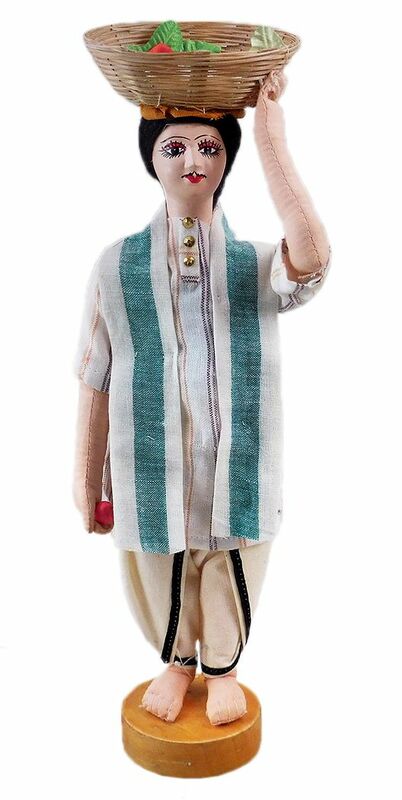 These kinds of unique handmade artifacts dolls aren’t available on Amazon India. The unique value these dolls offer is the unmatched design, color, beatification and rich cultural aspects of a state in modern times. There are very few sellers for these dolls online. If you happen to be in Kolkata, you can find many good manufacturers of such dolls to sell them online. The best way to find such products is to visit the local market and search for decorative or unique items. It will take some time but it is worth the effort to be able to find some unique products to sell online. One can grab high-profit margins because there aren’t too many sellers available online. There may not be a market for the product that you may try to sell online. So you may have to work out on building the market as well. 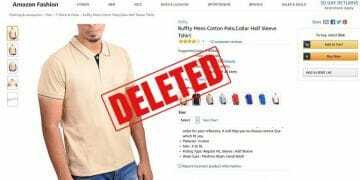 It isn’t very easy to find items that aren’t sold online these days on Amazon India. One has to look for a local manufacturer who isn’t still selling things online. There is always a fear of competition in reselling model once your products hit good sales. Other sellers can discover your products and start selling as well. Again this is always true for every product being sold online. 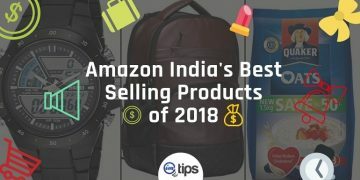 Among the best selling or most wished products from Amazon India, find a product that sells easily online. Look for a category where you can judge the quality of the product. Now opt for a competitors product that isn’t selling as well as the other and try to be an online reseller for them. One may find the competitor’s product option very similar to the distributor’s model. But in the distributor model, one opts to be a distributor of a hot selling product online whereas, for a competitive product, one looks for a hot selling product that isn’t selling for one of the competitors. 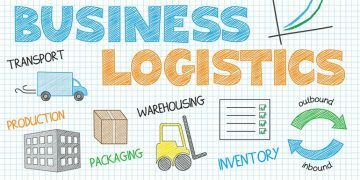 Because the product isn’t selling well, they may be more than happy to take you on board as a distributor or reseller. Here is one of the case study for you to consider. Competitor product model applies when you don’t want to sell products of big brands but still you want to sell the exact product that is selling well. In the above image, we have JBL in-ear headphone and Bluetooth speakers along with another brand called boAt. When I looked at the product reviews and rating count, found that JBL products sell lot more than boAt. As on Nov 10, 2018, there are 21093 reviews with 1000+ questions answered and is an FBA product whereas boAt has many of those options missing. 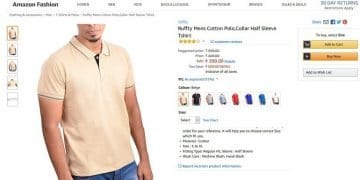 Alibaba is always an option for the product but there are other websites Indiamart for where you can buy products at a wholesale price and white label your own brand. Refer to the image below. Let’s say you bought this item for Rs.320/piece and sold it for Rs.599/piece (Rs.200 less than JBL) on Amazon India. 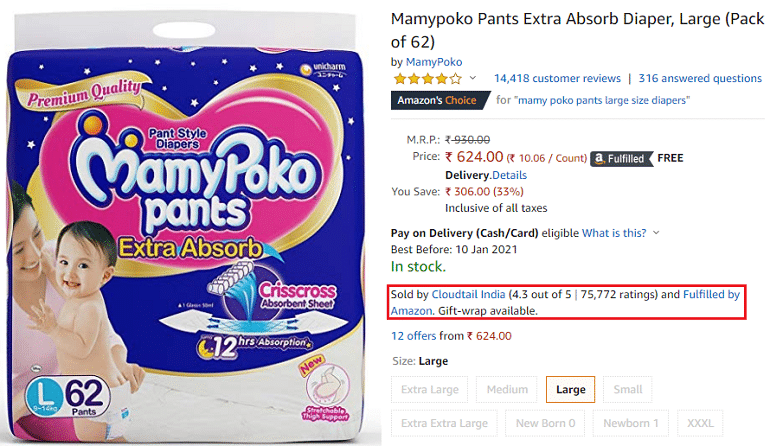 In this condition, you will be still making a profit of Rs.179/piece after deducting approx Rs.100/piece as Amazon India charges. 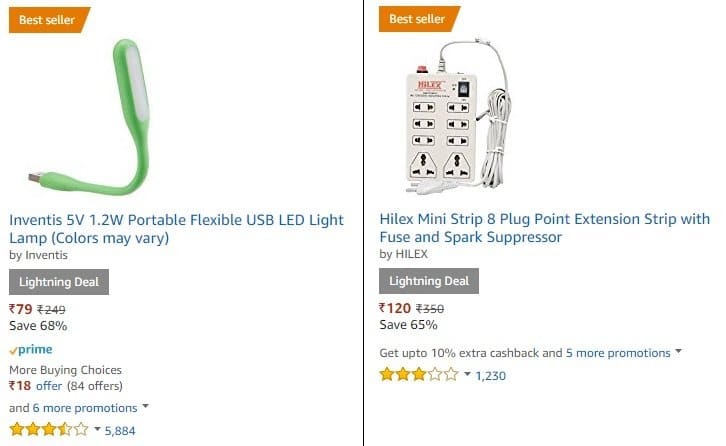 The idea will still work if you sell at Rs.499/piece securing a profit of Rs.79/peice after deducting amazon charges. You will get an established market and target buyers. No need to create products from scratch, just rebrand them and sell. You can show a comparative study of price and features of your products with the branded items. You can provide world-class customer support to leverage your buyers to help you build your own brand. 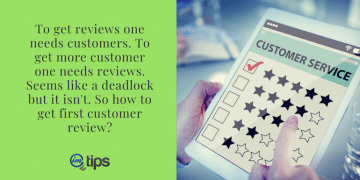 You may end up selling cheap products and fetch negative reviews if you don’t focus on the quality of the product. In order to get the lowest price per piece and to match it with the already running item, you will have to order in bulk quantity which requires a substantial capital investment. If the buyer is not satisfied with the product your return rate may go high. There is no exclusiveness in the product. It’s just the second copy of what others are selling. There is no rule that one should go with the above methods. You can become a distributor selling big brand items. Similarly, you can become a reseller of less famous brands or say small brands. An important thing to realize here is the big brands can help you generate more reviews. Whereas reselling items can help you get better profits.